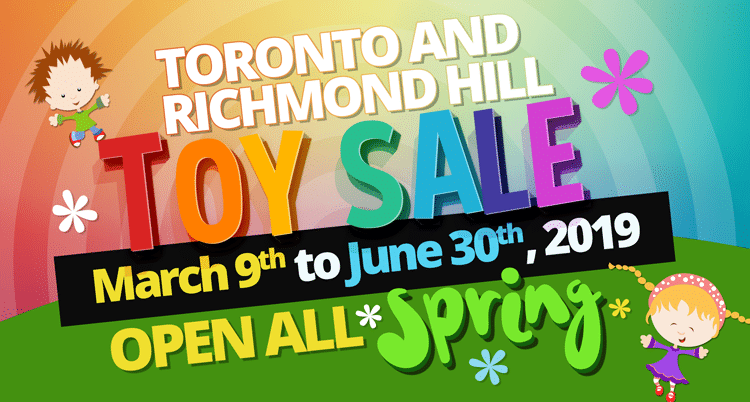 Toys Stores Open All Spring! Wondering what the big deal is about our Richmond Hills toy sale? Not all of our products are offered online. You’ll find great deals on our website, but you can expand your selection by going to see what we’ve found for our in-store sales. You’ll find 1000’s of toys, books, and crafts, including the best baby toys around. AMAZING! Do all you holiday and birthday shopping for the year and no break the bank! They have a great selection of popular genres of toys and books. You can pick up books for 1.75 and toys for 5.00. Even the pricier toys are quite reasonable here. A MUST VISIT! Amazing selection. Great prices. Went twice within two weeks and got the majority of Christmas shopping done for kids in my life that range one and a half through to seventeen.